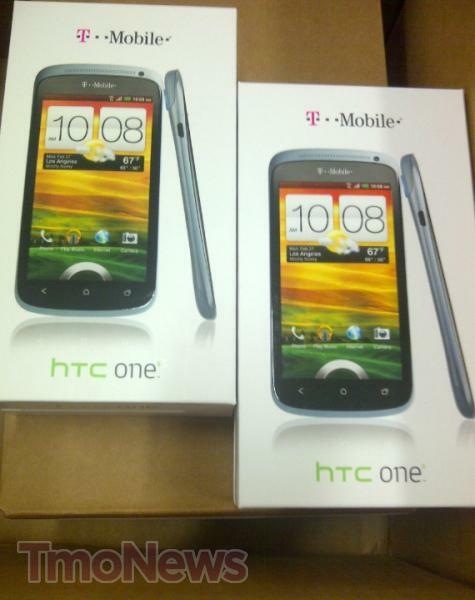 With less than twenty-four hours to go, the HTC One S is already making its way into T-Mobile retail stores and Walmart locations in preparation for launch. If you haven’t caught my official preview of the HTC One S, you’ll know that I’m very excited by this device and believe that HTC has manufactured an appealing smartphone and finally, yes finally turned around Sense 4.0 into a mature-looking Android overlay. It’s definitely worth a hands-on to see if the new HTC One line fits your style. Why not get it from Costco? You’ll save $11 off the bat ($61 by your other comment), get a package of accessories AND get $25 for any other Costco purchase. Seems like the best deal out there. costco, you may incur the tax on the full price of the phone. Walmart makes so much damn money, that they will absorb the tax. I live in MN, I paid tax based on the sale price. $13.53 was the total tax I paid. Maybe it’s different in other states? Let’s talk mothers day sale. Do you think the phones will be free? Since its less than 30 days away, will I be able to get the phone today, return it and get it for free if that’s an option? It does say $400…..what are the conditions allowing that price? $400 – $500 off contract IS what the price should be. The V is $350 off and the X is $550. Ya, just checked costco site and they are showing it retail at $399. There is now way to select retail price for pre-order but maybe that will change on the 25th. Just checked tmobile.com and its listed there as $649.99 for suggested retail… ha! T-Mobile pretty much does that for every phone they sell. For example, the Exhibit II 4G can be bought from Walmart for $179/189/198 (no contract), whereas T-Mobile.com lists the phone for $329! 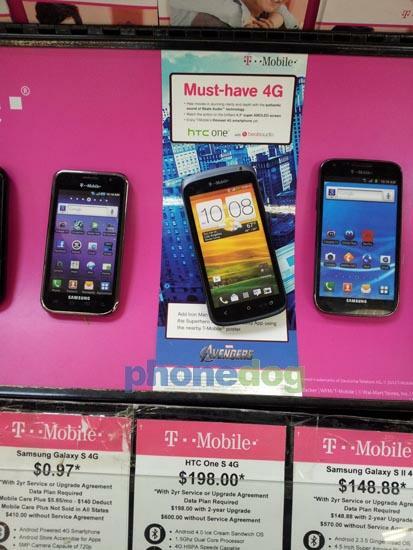 Sadly, the only time buying a phone for T-Mobile would be a good idea, is when they have those ‘Web-only’ deals. I see $600 as well after I save and zoom in on the picture. No way I would pay $600 for this phone. If they had put a non-pentile screen on it maybe. Should it actually come in at $450 I’ll buy, but surely not at $600. They’re pushing value plans, but every time there’s a launch it’s all about the 2 year contract price. Can we get some consistency here? I went to a TMo store yesterday and they had a actuall working One S Ihave to say that phone is amazingly comfertable to hold it was very fast it even looks a lot more slick then the pics make it to be. The gradient grey to blue is awesome look. The price will be the same but you will no longer be able to get the accessory package or the $25 cash card. The samsung galaxey in the picture 97cents. I will be going up to wall marts today. Nice device but i am torn between the One S, One X and the soon to be announced GS3. Google is selling the unlocked GSM 3G/HSPA+ GNex directly for $400…that is an option for those who don’t want to pay $600+ for the One S. I am more than willing to pay abt $600 for one of the three…depending on which one i decide to go with. Where are you guys getting $600? I haven’t actually seen ANYTHING saying what the no-service-agreement price is, other than the picture above which clearly says $400. Now, I have a hard time believing $400, but $600 is damn steep. kept getting an error code when trying to purchase at best buy… tried online chat they said no sorry can’t help you… call the 1-877 number. Screw that… I’ll just take advantage of the trade in deal. Will the HTC One S only be offered in Gradient Blue???? what about black with red trim ?? not true. black and red coming in june or july (i believe it was june). where did you get that info? is this official ? My brother-in-law works for TMobile and he confirmed the black/red version is coming out in June. I think I’ll be waiting till then to get this phone. It’s going to be hard to wait. The phone is crazy awesome from what the TMobile guys I know I say. now can you film it right side up… and pause at the end so we can read the scores please? sadly, did NOT arrive at our local walmart and we are just 50 miles away from Tmobile HQ.